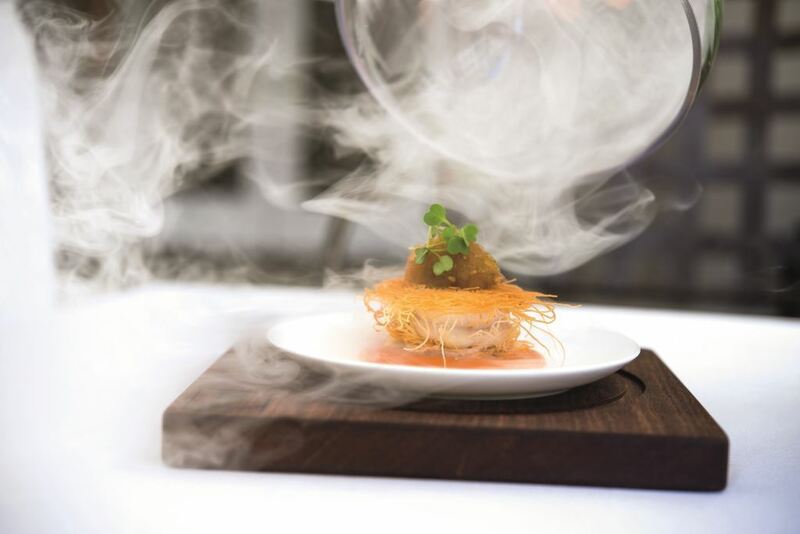 Smoked Shrimp and Grits is one of Chef Rick Laughlin’s signature dishes and one of the most requested menu items. Although difficult to duplicate at home, even a close interpetation will be a culinary delight. The following recipe serves 4 to 6 people. Cook the shrimp prawns last. -Place the prawns around the goat cheese balls. -Sear each side of the prawns in a hot pan with vegetable oil until golden brown. Dissolve sugar in vinegar. Combine all ingredients and cook on low heat. Cook until marmalade consistency. Cut tomatoes in half and toss with 1 tablespoon oil and salt. Place on grill and cover with sheet pan to trap the smoke. Cook until the tomatoes are barely charred. Try to get less heat and more smoke. Flip and repeat. In large sauce pot begin to sweat the onion with 1 tablespoon of Extra Virgin Oil. After onion gets soft, add the garlic and thyme. Cook for 1-2 minutes. Add the tomatoes and cook down until nearly no liquid. Blend the sauce with the herbs, butter and salt all to taste. Pass through a fine sieve and refrigerate. The end result should be well balanced. The flavors of all the ingredients should all be present. Sweat the onion with 1 tablespoon olive oil for 5 minutes. Add the rest of ingredients and stir. Bring to boil and reduce to a simmer and cook uncovered for 4 to 5 hours. Finish with butter and season to taste. -Place a tablespoon of the smoked tomato in the center of the plate. -Place ¼ a cup of grits on top of the tomato sauce, careful to keep everything centered. -Shingle the prawns on top of the grits. -Top off with the green tomato marmalade. -Place under glass dome and flash smoke with hickory shavings.